FILE -- A modern sculpture by Belgian artist Tom Frantzen shows former Belgian King Leopold II surrounded by animals and African warriors in the park of the Royal Museum for Central Africa in Tervuren, Belgium, Jan. 22, 2014. After a five-year remodel, it reopened, Dec. 8, 2018. Belgium's Africa Museum reopened on Saturday after a five-year restoration to repackage its looted treasures with a critical view of the country's brutal colonial past. Deputy Prime Minister Alexander De Croo hailed a "historic moment" and said it would open "a new chapter" in Belgian-African relations. Last month, French President Emmanuel Macron agreed to return 26 cultural artifacts to Benin "without delay," a move likely to put pressure on other former colonial powers to return African artworks to their countries of origin. 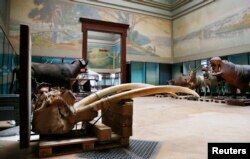 FILE -- Elephant tusks are seen near stuffed animals at the Royal Museum for Central Africa in Tervuren, near Brussels Jan. 22, 2014. After a five-year renovation, the museum reopened, Dec. 8, 2018. Macron said the decision should not be seen as an isolated or symbolic case and proposed a conference in Paris next year to discuss an "exchange policy" for African treasures. "Restitution should no longer be taboo," De Croo said on Saturday adding, however, that any returns should be dependent on certain conservation conditions being met. "It is clear that this implies a respectful attitude on the part of the African authorities with regard to this artistic heritage," he said. Before it closed for refurbishment in 2013, visitors to the Belgian museum were greeted by a statue uncritically depicting white European missionaries "bringing civilization to Congo." Despite the new approach more in keeping with Belgium's multicultural present, the revamp has not been without controversy. Paula Polanco told AFP her group, Intal-Congo, wanted them to be recognized as "victims of a colonialist crime." Belgium's current king, Philippe, meanwhile declined an invitation to the reopening. These countries have suffered a turbulent modern history and for European experts, in DR Congo's case at least, lack premises to properly house a national history collection. For Guido Gryseels, the museum's director general, the political backdrop is part of a broader Belgian conversation about race that goes beyond the rights and wrongs of the ownership of his museum's exhibits. And although the museum has been redesigned, statues and street names still honor Leopold, who personally enriched himself through the forced labor of the Congolese during a period in which an estimated half of the local population -- up to 10 million people -- were wiped out by overwork, violence and disease. "Personally speaking, I think that indeed someone who is responsible for mass murder is not to be put literally upon a pedestal," Bambi Ceuppens, doctor in anthropology at the Royal Museum for Central Africa, said.